Established in 1997, Attenda is Europe’s leading specialist in operating Internet and enterprise applications. The company provides infrastructure management, web application system management, Citrix, SAP Managed service and Software as a Service facilities for over 130 Clients including bmi, Christian Aid, easyCar, Microsoft, NHS, Princes, St James’s Place and Travelodge. To ensure a responsive, proactive management service for client systems, Attenda uses Hornbill’s Supportworks service management software to enable its 24 x 7 Support team to track Incident, Problem and Change requests. 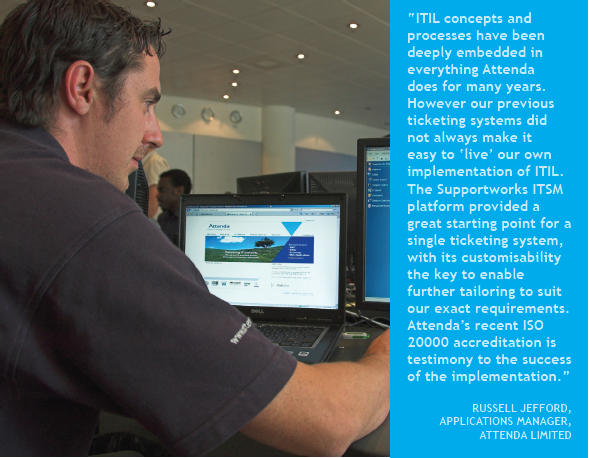 Supportworks replaced an existing customised ticketing system that had been in place for over seven years. Hornbill’s solution was originally selected over four other vendor offerings chiefly for the ease with which it could be integrated into Attenda’s existing systems, its compliance with the ITIL framework and potential for further customisation. Since the initial implementation, Attenda staff have received additional training to further customise Supportworks for their needs and within months of switching over to Supportworks have already begun further tailoring and fine tuning the template to their evolving requirements. Supportworks was also chosen since it provided a good platform to support Attenda’s existing ITIL processes. Since Attenda already possessed a mature Configuration Management Database (CMDB) containing data on client solutions (servers, routers, software, business services, etc), the decision was taken to replicate the data in Attenda’s CMDB to the Supportworks CMDB on a frequent basis, thus ensuring that monitoring alerts are automatically associated with the relevant Configuration Items when calls are logged. Attenda can view a comprehensive Incident, Problem and Change Management history against each Configuration Item in Supportworks which improves the ability to make informed decisions. Being a managed service provider, Attenda’s support function has a different approach from the traditional reactive helpdesk supporting internal users or clients. 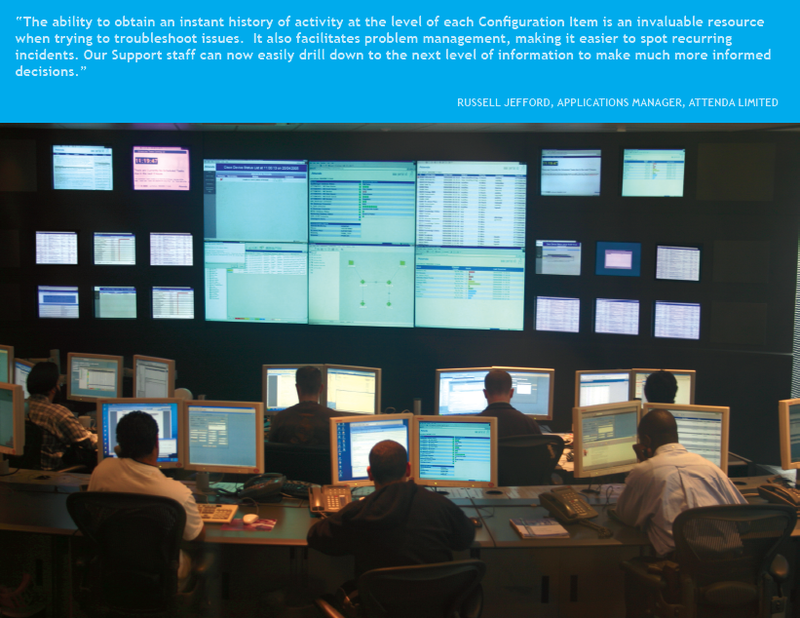 Attenda monitor client environments proactively, raising calls as incidents arise – whether network, hardware, software or business service related. All monitoring alerts are channelled into Attenda’s proprietary web based interface, from where integration work (carried out in conjunction with Attenda’s developers) enables calls to be logged directly into Supportworks ITSM with just a couple of mouse clicks. This integration makes it easy for Attenda management to gather performance statistics and run reports to identify the relationships between the various types of calls.